Faceware Technologies’ latest game demo reel. 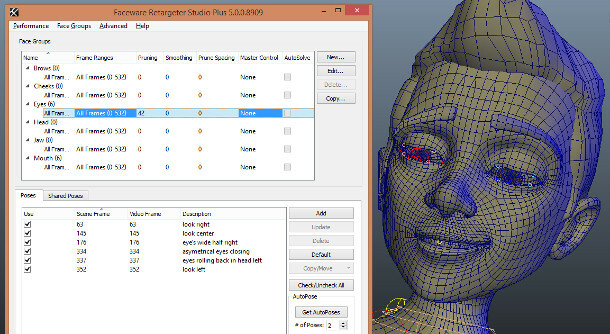 The firm has just announced updates to its markerless facial motion-capture software, Analyzer and Retargeter, and a new free PLE edition of both applications. Faceware Technologies has announced updates to its line of markerless facial motion-capture products, including new versions of Analyzer and Retargeter, and a free Personal Learning Edition of both products. The company has also introduced new tripod-mounted camera systems on top of its existing head-mounted solutions. All of the new products will go on show at GDC 2016 next week. The technology, which was recently used on AAA games including XCOM2, Dying Light and Hitman, comes in three parts: software packages Analyzer (above) and Retargeter, and an optional camera system. The software packages form a two-part markerless facial performance capture pipeline: Analyzer processes live footage of an actor’s face, while Retargeter controls how its output drives the animation of a CG character. Analyzer is a Windows-only standalone application; Retargeter is a plugin for 3ds Max, Maya and MotionBuilder. Both Analyzer 3.0 and Retargeter 5.0, the latest versions of the software, get support for timecode, and Analyzer also gets support for editing the in/out points of any new video. The new features reflect growing interest in Faceware’s technology in the film and TV markets, which now represent around 20% of the company’s client base, including well-known VFX studios like Atomic Fiction. Both applications have also been localised into nine new languages, including Chinese, Japanese and Korean. In addition, users can now capture video into Analyzer 3.0 in real time; while the shared pose library functionality in Retargeter, intended for team collaboration, has been extended in version 5.0. While shared pose libraries were previously only available in the high-end edition of Retargeter, the new update makes them available in the – now significantly extended – entry-level edition. The latter has now been renamed from the Lite edition of the software to the Studio edition; while the former has been renamed from the Pro edition to the Studio Plus edition (shown above). In addition, there is now a new free Personal Learning Edition with identical functionality of the Studio editions of Analyzer 3.0 and Retargeter 5.0, but which is not licensed for commercial use. According to Faceware Technologies’ VP of business development Peter Busch, the PLE edition is designed to address the needs of people wanting to use its technology on personal projects. “We didn’t really have a solution for them [before], even though 85-90% of our leads [for new business] were in that category,” he told CG Channel. Faceware has also announced two new tripod-mounted camera systems for use with its software, both including lights and a SDI to USB 3.0 converter. As with Faceware’s existing head-mounted camera systems, the entry-level model is based round a GoPro, while the pro-level version uses a “prosumer camera” – the product shot shows a Sony camera. The new tripod set-ups are intended for use in voiceover booths or in situations where actors need to move around unencumbered – although according to Busch, a lot simply comes down to personal preferences. “We always tell people to do whatever gets the best performance from an actor,” he said. 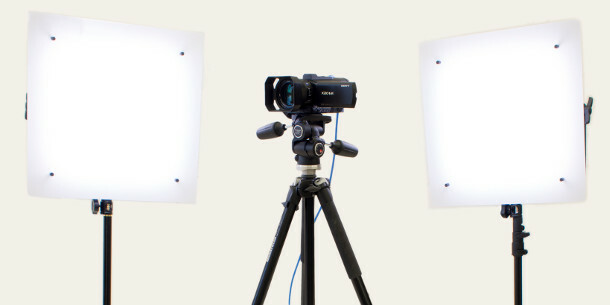 Although the new tripod set-ups introduce “more redundancy” in the source footage, due to changes in facial expression being compounded by the motion of the actor’s head relative to the camera, Busch said that he expected output quality to be identical to the head-mounted systems. Pricing for new licences of the software starts at $1,995 for the Studio edition of Analyzer 3.0, up $1,200 from the previous Lite edition, which Faceware attributes to the additional functionality it makes available. The Studio edition of Retargeter 5.0 now starts at $995. As well as perpetual licences, the software will be available on a rental basis, with pricing starting at $340/month. The new Personal Learning Edition will be a free download. Faceware is also offering new bundle deals including both the software and the new tripod-mounted camera systems, which are priced higher than the head-mounted system. For comparison, the new Pro Complete systems will start at $11,975, while their tripod-based equivalents will start at $15,975. Updated 10 March: The new products will begin shipping tomorrow, 11 March 2016. An earlier version of this story also incorrectly stated the price of Analyzer 3.0 Studio as $995.